Easy backup & flexible restoration! – Set & Run technology! Whether simply saving data, automating backup processes, or creating complex backup routines, Backup & Recovery 16 covers all your needs. Not sure which setting is most suitable? No need to worry! The powerful software wizards guide users step by step through the backup jungle – and the newly designed UI will clear the path! Backup strategies are designed to easily set and run automated backup jobs. 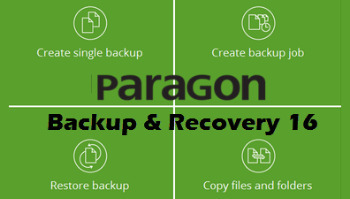 Choose from our reliable pre-defined strategies or design your very own strategy with Paragon’s new backup strategy design tool. The product is stuffed with enterprise-class technologies such as the rock-solid, time-tested proven backup engine or the advanced Paragon backup archive PVHD (Paragon virtual hard disk). PVHD archives can be mounted and browsed within your Windows system (assign a drive letter) and are perfect for storing on a network share thanks to its CRC technology. The mighty restore wizard rules restorations of all kinds. Equally useful for retrieving entire systems, disks or partitions or single files, the software puts the user in full control. Restoration to different hardware? With Backup & Recovery 16, a backup of the entire system can be restored even on new hardware with just a few clicks. Create and automate backup tasks. Supports all backup techniques like differential, incremental, full, file based etc.